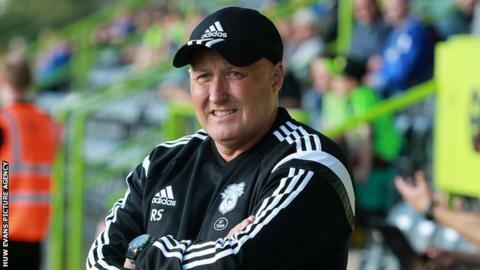 Cardiff City manager Russell Slade says he is focused with on-field matters rather than the threat of legal action against the club. BBC Wales Sport has learned Sam Hammam is prepared to take the Bluebirds to court to fight any attempts to remove him as life president. Cardiff's board meet on Friday to consider stripping Hammam of the role he was given in 2013. "We're totally focused on the football," Slade said. "We've been away at a boot camp and working from seven in the morning until five or six at night. "I'm expecting full focus from the players and that's all we're concerned about." Hammam was made life president as part of the settlement Cardiff reached with creditors Langston to repay a £24m debt. City's ex-owner has widely been seen as a representative of the corporation. This latest twist comes after Hammam confirmed in February that current Cardiff owner Vincent Tan and the club were being sued over nearly £6m still owed to Langston. The Swiss-based corporation claimed Cardiff failed to meet a 30 January deadline for repaying the outstanding amount of £5.75m. The club want to know the identity of Langston before paying anything and issued a counterclaim against Hammam and Langston with the High Court. It is believed Cardiff City claimed the club had overpaid on the debt. The latest developments came as Cardiff City kicked off their pre-season campaign with a 1-1 draw away to National League side Forest Green Rovers. "It's all about getting minutes on the pitch at the moment," Slade said. "It was a good workout for us, a competitive game that we got well on top in the second period and probably should have helped ourselves to a few more goals. "But it's not about that at this stage."